A paradise close to everything, surrounded by nature where you can breathe fresh air, in a truly tranquil and inspiring environment, but close to the main urban centres thanks to its privileged location! The development is located in the municipality of Oeiras, next to Taguspark and benefits from excellent road accesses. It is at about 8 minutes from the centre of Oeiras , 15 minutes from the city of LISBON, 20 minutes from Cascais and 15 minutes from Sintra, all this thanks to the proximity to the A5 motorway (by the highway that leaves the node from Porto Salvo towards Taguspark (EN 249-3), the IC19 expressway (5 minutes) and the CREL and IC16 motorways (10 minutes). 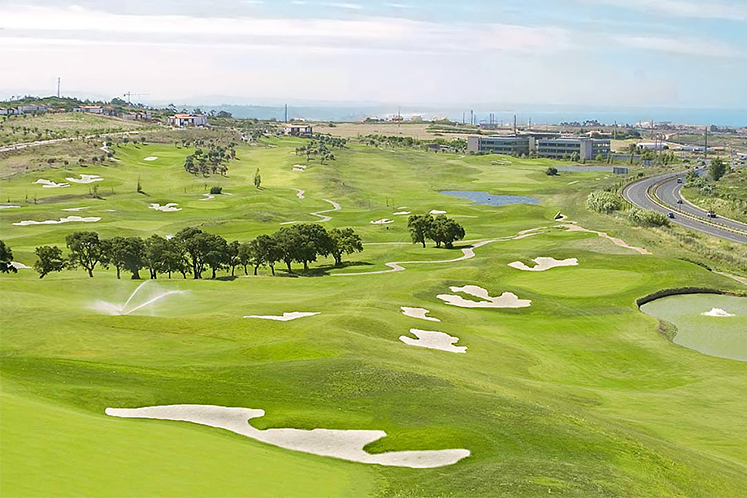 Oeiras Golf & Residence (OG&R) is located on a 1,120,000 m2 site where everything has been thought out in detail. Here you will find lots for construction of villas, townhouses and terraced houses, apartments and large green spaces. The residential project, with more than 112 hectares, includes more than 500 houses, a part of which has already been built. This integrated project includes the components: landscape, environmental, leisure and sports. Surrounded by the most important business centres of the Country: Taguspark, Quinta da Fonte and Lagoas Park, the OG&R also has a 9-hole golf course, particularly suited to an urban clientele that has less available time and plays whenever can, many times in the work intervals. In the immediate vicinity you will find the: Park International School , Taguspark College , Oeiras International School , Atlantic University , etc. 20 minutes away: St. Julian's School , Colégio Marista de Carcavelos , St. Dominic's International School , etc. Trade: Shopping Oeiras Park , Comercial Center São Marcos , Forum Sintra , etc. Services: Pharmacy Taguspark, Gymnasiums, Hairdresser, Laundry, Banks, Clinics and Hospital da Luz (10 minutes by car), Rent-car, etc. Business Parks: Taguspark (in which OG&R is inserted), Lagoas Park , Quinta da Fonte Business Park , etc. The residential and tourist development , presents an innovative concept: the construction by modules that adapts to the needs of each client. The development is located in the municipality of Oeiras and has an area around 112 hectares, consisting in lots for the construction of houses, apartment buildings, a hotel, touristic apartments, an 18 holes golf course with Club House and many leisure equipment’s. The development comprises a building area around 300 thousand square meters. There are lots already built and others still available for construction, destined to houses, detached and in band, hotel and aparthotel (Phase B) and lots for condos. Regarding to the condos, three blocks have already been built, with two buildings each, and it is planned to build another 7 blocks of apartments with typologies from T1 to T4, which lots are available for sale. Regarding to the construction of houses, there are lots still available for sale, for the different typologies (single-family, semi-detached and in-band). The house project can be conceived from scratch, as long as it respects the building regulations in the development and can thus evolve in a more creative way compared to the initial architecture projects. From investor’s point of view, the venture is a safe bet, whether it is a private individual or a company. The current panorama of strong demand in the real estate market has helped to deplete supply within the city of Lisbon and is "pushing" demand to the periphery, with emphasis on Oeiras. The central location of the OG&R in one of the places near Lisbon with greater demand and real estate valuation, together with the fact that there are still land available for sale at prices lower than those practiced in other similar projects (eg Belas Club de Campo, Quinta do Cerrado, or in the other premium zones of the municipality), has contributed to the property valuation rates in two digits per year! A unique opportunity to invest or to live with the family within walking distance of Lisbon, in a quiet and safe environment, and above all, of quality. Come and enjoy an incomparable quality of life in a unique development. If you wish to buy a house, (apartment, townhouse, a building plot, farm, estate, etc.) in this location, see here the offer that I have available. If you do not find the property you are looking for, please contact me, because the internal network of Keller Williams Portugal has many opportunities that awaits for you and some of them will certainly meet your needs.